This pet training pad holder contains messes to protect your floors. Easy snap on/off grate system will prevent teething puppies from getting to training pads. 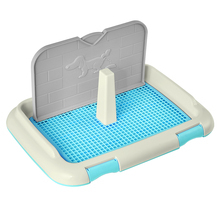 High quality perforated grate will allow pee to flow directly below your pets feet into the training pad. Suit for small and medium dogs and cats. chihuahua туалетик very good for all on description accurately. size m suitable. fit. приучаем to it. looks like the picture. very neat and cute. immediately accepted new pet toilet. toilet cool. no more male our true used it. it and all walks нюхает. but does not want terrier-the all fast and forth справлять neeed. super! very satisfied. shipping fast. пришёл order very fast, отслеживался, store recommend quality is good. tray is very good. really super tray!!! have not has set bar. fast shipping.